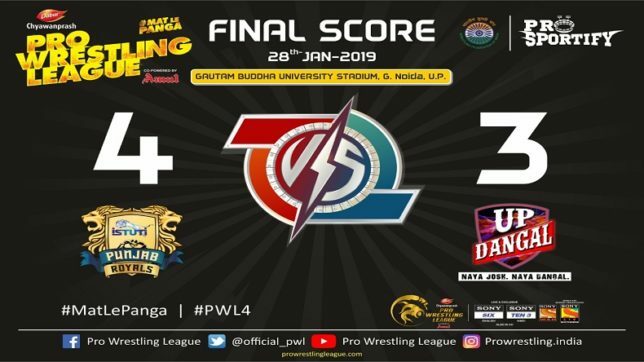 After 2 weeks of exciting bouts, riveting encounters and memorable performances the group stages of the 4th season of the Pro Wrestling League draws to a close with the final fixture to be played between Punjab Royals and UP Dangal at the Gautam Buddha University Indoor Stadium in Greater Noida. Punjab Royals sit pretty on 2nd position while the UP Dangal sits bottom but has a chance to climb up the table if they manage to win this match. UP Dangal has had a tough season winning 2 and losing 2 so far but a comprehensive victory in this match will lift them above Delhi, Mumbai and MP into 3rd place and into the semis. They will be hoping that their stars turn up under pressure to make sure of the team’s progress to the next round. Navjot Kaur has had a torrid time in this campaign but UP will be hoping that her experience pays off at the business end of the tournament. The bouts to watch out for on the final night of group stages includes Bajrang Punia vs Pankaj Rana, Mimi Hristova vs Sarita and Amit Dhankar vs Jitender. Anita wins the Player of the match award for her amazing performance against the experienced Navjot Kaur in the Women's 62 kg category. 1 point for Amit right at the start but Jitender hits back with some solid moves to lead by score of 6-3 with 2 minutes remaining. Amit stages a stunning comeback to lead 7-6. Amit scores further 2 points but Jitender is trying his level best and wins 2 points to reduce the lead to 1 point. Jitender takes down Amit to win the bout for UP Dangal by a score of 10-9. Cautious approach at the start from both grapplers as Jitender takes a point's lead due to Amit's passivity. Jitender takes down Amit to win 2 points right at the death to take the round 3-0. Jitendra will face Amit Dhankar in the Men's 74 Kg category in what is expected to be a blockbuster clash in the final bout of the night as Punjab has sealed victory on the night with a 4-2 lead. Irakli looking to attack but Dato is dodging expertly and trying to attack himself. Dato increases his lead courtesy of a 3-point push out and looks comfortable against his countrymate. Dato wins the round and bout by a collective score of 5-0 to give the lead to Punjab Royals 3-2 on bouts won. Dato opens the scoring for Punjab with a 2 point move. Both wrestlers are looking for an opening to exploit but are unable to score any more points. Dato leads 2-0 with the 2nd round to go. Irakli Misituri will represent UP Dangal in the men's 86 Kg category against Punjab's Dato Marsagishvili in the important 5th bout on this final group stage night as scores are delicately levelled at 2-2. Mimi hits back to equalise at the start of the 2nd round. Sarita looking to win the round but is unable to break Mimi. Mimi takes the match with a score of 4-2 to level the match at 2-2. Sarita will have to face the exciting Mimi Hristova in the Women's 57 Kg category in the 4th bout on the night. UP Dangal lead 2-1 after 3 bouts with 4 bouts remaining. A probing start as both wrestlers are gauging each other's moves and Bajrang initiates to take a point's lead followed by another 2 points to extend his lead to 3 points. Bajrang wins the round by a score of 3-0 ahead of the 2nd round of the bout. The most anticipated bout of the night pits Pankaj Rana against Padma Shri Bajrang Punia in the highly competitive men's 65 Kg category in the 3rd bout of the night as UP has a solid 2-0 lead with 5 bouts remaining. Vanesa takes down and turns Anju at the beginning of the 2nd round to win 4 points. A 2-point move for Anju while Vanesa takes a point with 30 seconds remaining. Vanesa wins the bout by a score of 12-6 extending UP's lead to 2-0 with 5 bouts remaining. Anju starts the round positively and wins 4 points but Vanesa performs some lovely moves to gain 3 points. Vanesa takes the lead courtesy of a 2 point move as the round draws to a close. Vanesa leads by a score of 5-4. Vanesa will face Anju in the lightest weight category of women's 53 Kg in the 2nd bout of the night as UP Dangal lead 1-0 with 6 bouts remaining. Giorgi up against the passivity clock as he attempts to score but Korey equalises. Korey then pushes out Giorgi to take a 1 point lead. 2 points right at the whistle for Giorgi which is challenged by Jarvis and the officials decide in Giorgi's favour to take the bout by a score of 4-2. The first round begins as Giorgi tries to attack quickly but can't convert it into points as the round winds up with a 1 point lead for Giorgi after a dull round. Giorgi Sakandelidze will compete with Korey Jarvis in the heaviest weight category of Men's 125 Kg category in the 1st bout of the night in the final league game. Punjab Royals wins the coin toss and block women's 76 Kg category while UP Dangal decides to leave out men's 57 kg category in the final group stage match on Day 15 of the tournament.